This Bookreporter.com Special Newsletter spotlights a book that we know people will be talking about this spring. 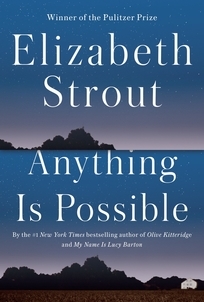 Read more about it, and enter our Spring Preview Contest by Friday, March 31st at 2:00pm ET for a chance to win one of five copies of ANYTHING IS POSSIBLE by Elizabeth Strout, which releases on April 25th. Please note that each contest is only open for 24 hours, so you will need to act quickly! Recalling OLIVE KITTERIDGE in its richness, structure and complexity, ANYTHING IS POSSIBLE explores the whole range of human emotion through the intimate dramas of people struggling to understand themselves and others. Here are two sisters: One trades self-respect for a wealthy husband, while the other finds in the pages of a book a kindred spirit who changes her life. The janitor at the local school has his faith tested in an encounter with an isolated man he has come to help; a grown daughter longs for mother love even as she comes to accept her mother’s happiness in a foreign country; and the adult Lucy Barton (the heroine of MY NAME IS LUCY BARTON, the author’s celebrated New York Times bestseller) returns to visit her siblings after 17 years of absence. - Click here to visit Elizabeth Strout's website. - Connect with Elizabeth Strout on Facebook and Twitter.